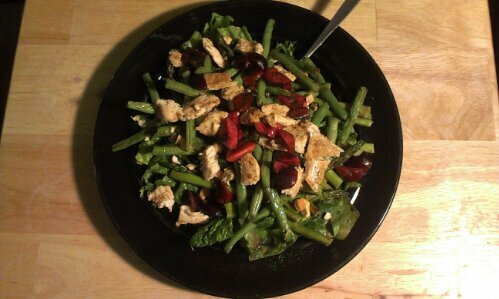 Jack recently made this delicious salad with chicken, mixed greens, spinach, asparagus, green beans, cashews, cherries, and feta, sprinkled with balsamic vinaigrette. Yum! Now that’s a salad! I love the sound of this especially the combo of cashews, cherries and feta. I’ve done a lamb, cherry (which I soaked in balsamic and a little maple syrup) and feta salad before, which was yummy. I shall definitely give this a go. Oh my gosh I am SO HUNGRY. So hungry right now!! It looks delicious!